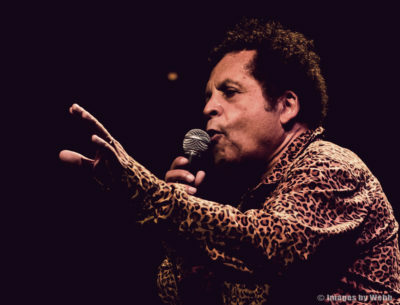 At 73 Garland Jeffreys may not need a bigger audience in this country but his music sure as heck deserves it. Its warm embrace of rock, soul, jazz, blues, reggae and merengue is allied to literate, searching lyrics that have been striking chords with everything that’s right for nearly 45 years. A native New Yorker who has counted the likes of Bruce Springsteen, Lou Reed, John Lennon, Joe Strummer, Bob Marley and Van Morrison as friends and admirers, he slayed Kyps two years ago when he came to Poole as part of only his second ever UK tour, but if he was even a trifle disappointed that Friday’s audience wasn’t bigger he had the good grace not to show it. An insightful anecdote about John Lennon’s sweetness set up a radical reworking of Help! and an equally astute reading of Bob Dylan’s magpie genius did likewise for a locked-down take on She Belongs To Me. Both emphasise Garland’s been-there-done-that credentials although his own songs do much more – from the wounded reggae lament of Ghost Writer and the mordant minor chord shuffle of Hail Hail Rock ’n’ Roll, to a pepped up Harlem Bound and the slick groove poetry of The Contortionist. He fantasises about the demise of Trump Tower in New York Skyline, takes the mic for an off stage wander, stands on chairs, hugs fans and takes it back to the street with Lou Reed’s Waiting For the Man, before bringing a tireless set to a close with a barnstorming 96 Tears and his early years stand out Wild in the Streets. Regardless of a ten-hour drive from Newcastle to get here, his performance was every bit as committed, urgent and earnest as last time, his band as fluid, the beat as robust and the message as clearly delivered – be good to one another and go in peace.